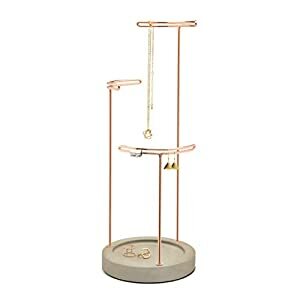 Make your jewelry look its best…apart from when you’re wearing them that is!Introducing Tesora Jewelry Stand by UmbraTESORA delivers the unexpected – using materials like copper and concrete – often associated with industrial buildings and construction, to create a truly beautiful piece that can store some of your most delicate and cherished items.Three-Tier StandTESORA’s concrete resin dish with three copper posts at varying heights displays your favorite necklaces, bracelets, bangles, rings, earrings and more. 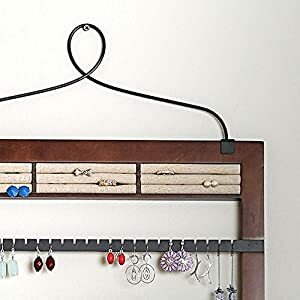 Its stand features unique double wire detailing on each post for easy and secure display of studded earrings or cufflinks. 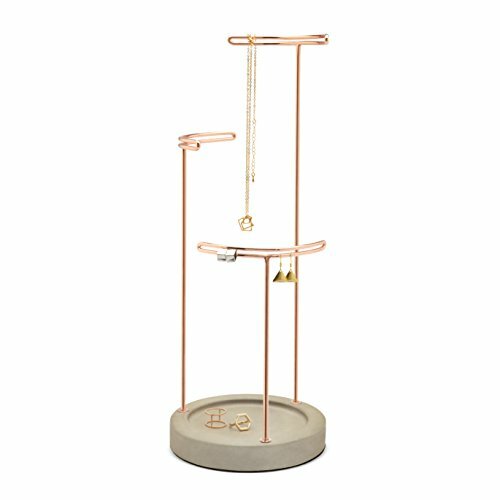 Its concrete base functions as a dish for holding rings, broaches and other accessories.TESORA Jewelry Stand measures 6 ¼ (diameter) x 16 ¼ inches (height).About Umbra:A global product design company providing original, modern, casual, functional, and affordable design for the home. 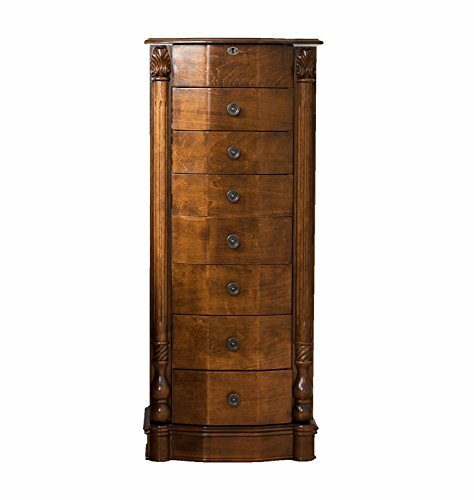 This beautiful 8-Drawer Wood Jewelry Armoire Stand is almost 40 inches tall and requires no assembly. 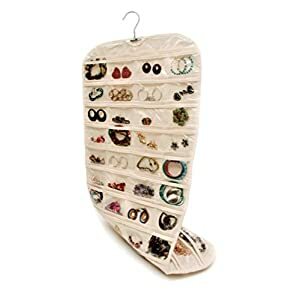 "The hives & honey jewelry hanger is the ultimate hanging jewelry organizer, ready to store hundreds of jewelry pieces, keeping them tangle-free and ready for easy access! 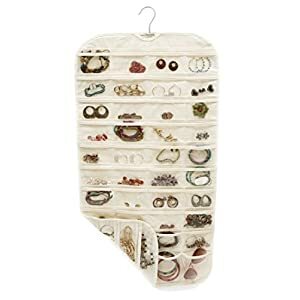 it features a removable bracelet bar for organizing bracelets, watches and other larger accessories, ring rolls, earring hooks and necklace hooks. 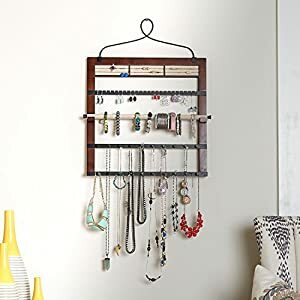 The included black metal rod acts as a wall mount; easily screws on and anchors making installation a breeze. " 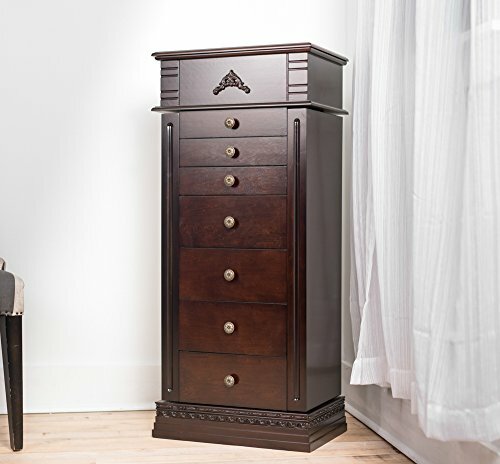 Enter the Chelsea jewelry armoire. 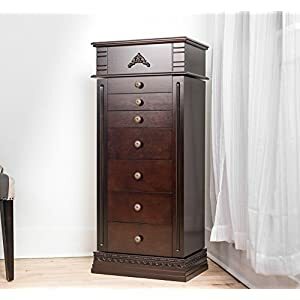 It's everything you want in a furniture piece. 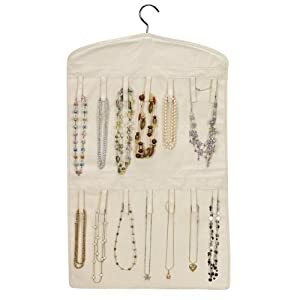 Lovely, useful and keeps everything in its place and tucked away, the Chelsea is the answer to all of your jewelry storage needs. 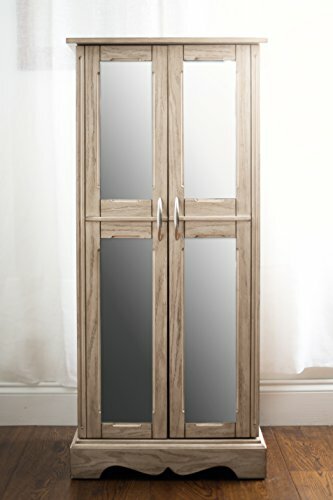 The grey mist finish has a rustic, neutral appeal that will fit most any decor. 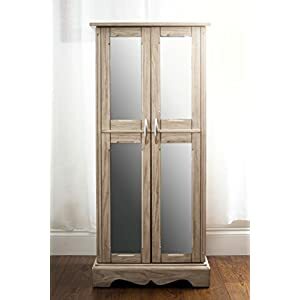 The simple, classic design features solid wood construction, French-style doors with a mirror front, and polished hardware. 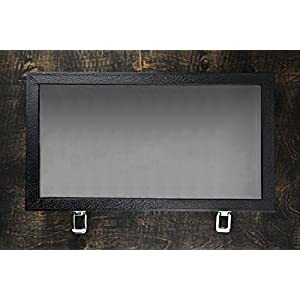 The hinged lid lifts to reveal a convenient vanity mirror, also boasting handy divided compartments and it's lined with anti-tarnish felt, ensuring your prized possessions are preserved and pristine. 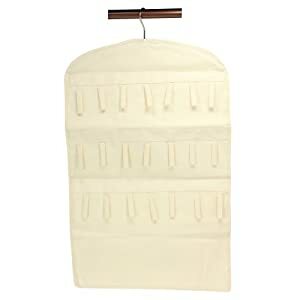 Upon opening the French doors, you'll find even more space to include 16 necklace hooks and 7 spacious pull-out drawers. 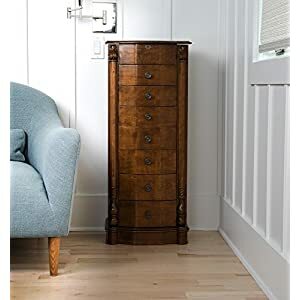 This elegant little storage solution has so much room, you could use it for storage in almost any room in the house. 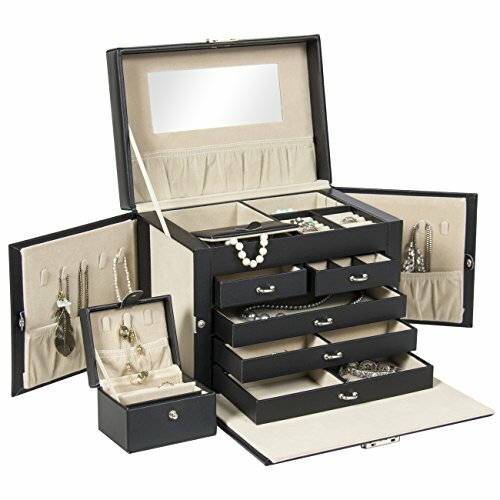 7 spacious drawers are padded and lined with an anti-tarnish felt to protect pieces from damage. 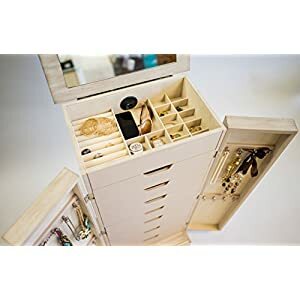 Divided drawer compartments keep small items organized. Side doors open to reveal 10 double-tiered hooks to keep necklaces neatly stored and tangle-free. 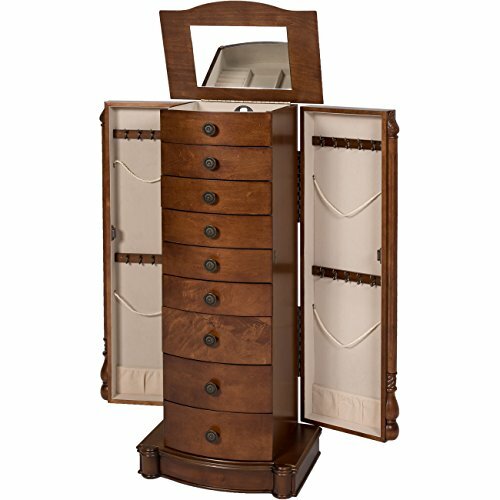 Lid lifts to reveal a vanity mirror, along with divided compartments and ring rolls. Outer dimensions 14 1/2" x 8 1/8" x 3"
The Antoinette Jewelry Armoire is a Hives and Honey favorite. 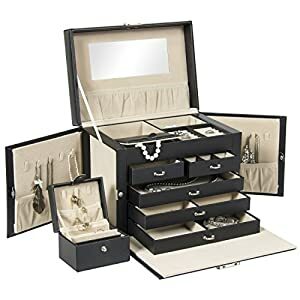 Standing at nearly 38 inches tall with 7 pull out drawers lined with anti-tarnish felt, divided compartments, ring rolls and two side panel doors with necklace hooks in each, the Antoinette is made to store your entire jewelry collection. To top it off, the top opens to reveal a vanity mirror, allowing you to get ready and take one last look before going out. 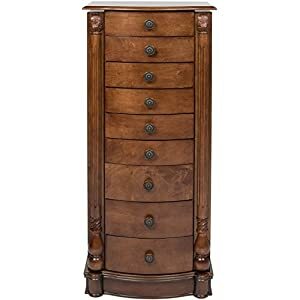 Complete with a rich walnut finish, hand-applied by a team of artisans in a multiple step process, this elegant jewelry armoire looks and feels like an expensive family heirloom. 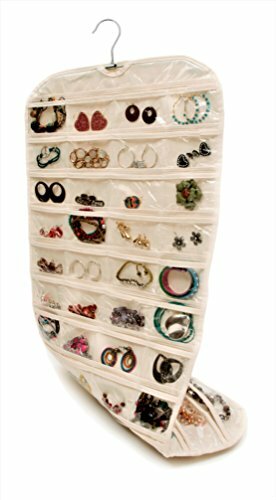 The SE JT9379T Glass Top Jewelry Display Case is for storing, organizing, and displaying your precious jewelry and items. 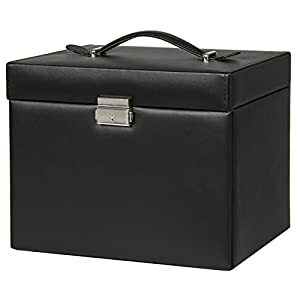 It is great for your personal or professional collection for dust resistant storage, easy recognition, and organization. 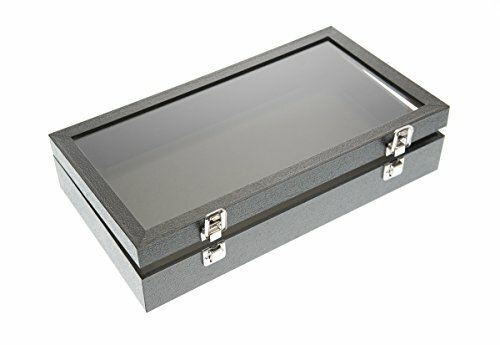 This jewelry display case can be used to display your jewelry or other items with the glass lid in the black wooden box. 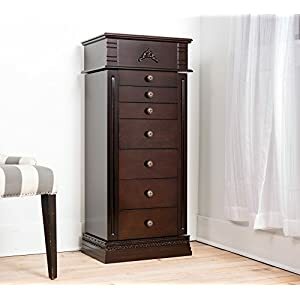 The metal latches and hinges. 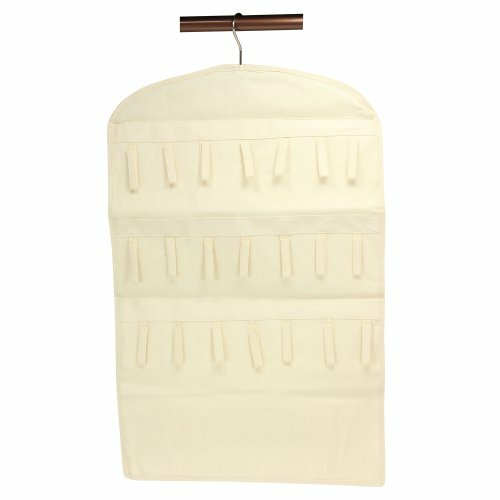 The overall dimensions are 14 1/2" x 8 1/8" x 3". SE is committed to providing the customer with the best source for value possible on the market. 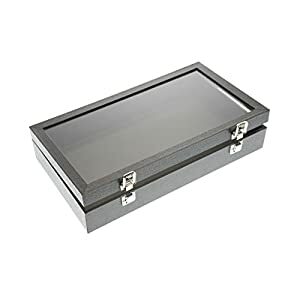 You will enjoy the quality, function and usefulness of our SE JT9379T Glass Top Jewelry Display Case. IPR Rights Notice: Important: Avoid getting counterfeit items. Genuine SE products come with the SE logo on the packaging. SE is a registered trademark protected by US Trademark Law.